I have been using Windows operating system from the very first time when I bought my first desktop PC. I have tried many other operating systems like Linux, Fedora, Ubuntu, etc. but stopped with Windows. Microsoft released Windows 10 on 29 July 2015. Windows 10 came with new and very useful features. The users have one year to upgrade Windows 7, 8 and 8.1 to Windows 10 for free. 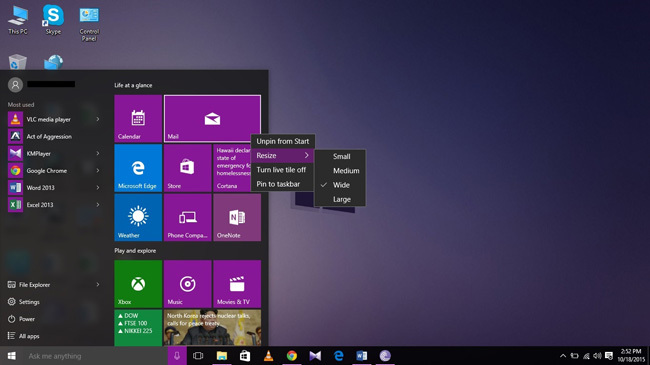 So whether you upgrade or not here are the some of the new cool features of Windows. Windows 10 comes with a personal voice assistant. If you are lazy and don’t want to lift a finger then you can interact with your device by giving the voice commands. You can ask date, time, set up a reminder, events or launch the programs and even ask the funny question. It searches your hard drive or go online for the things you asked. 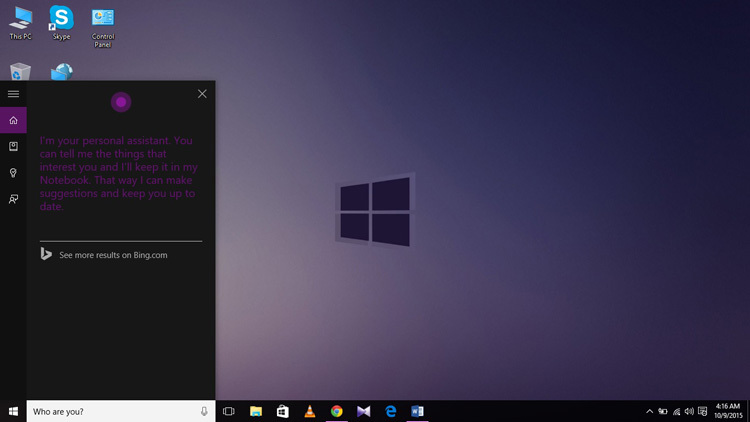 You can activate it by just saying “Hy Cortana” also you can set the Cortana only to respond to your voice. It is very familiar and can easily recognize what you want to do by giving voice commands. Some experts claim that Cortana is much familiar with users voice than Google Voice and Siri. The start menu which is eliminated in Windows 8, now came back. 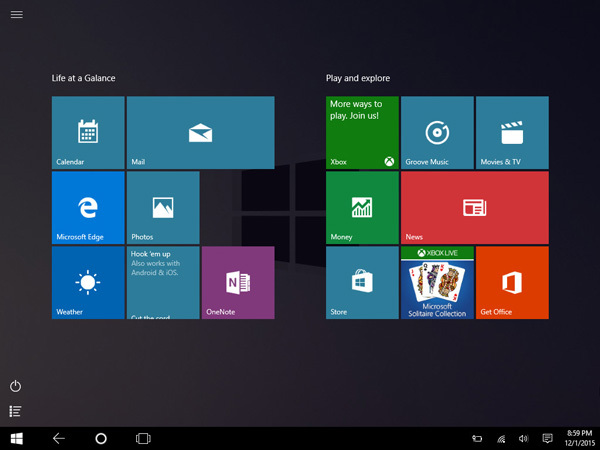 Tiles of different software’s and features shown on the right side of the start menu. You can also drag, unpin, resize, turn live tile off and pin the tile program to the start menu. You are automatically land in the search bar and write anything to search when you open the start menu. “Most used” programs shown at the left side of the menu. At the bottom left corner File Explorer, Setting, Power and all apps buttons are shown. Even more, you can expand the start menu to the full screen. 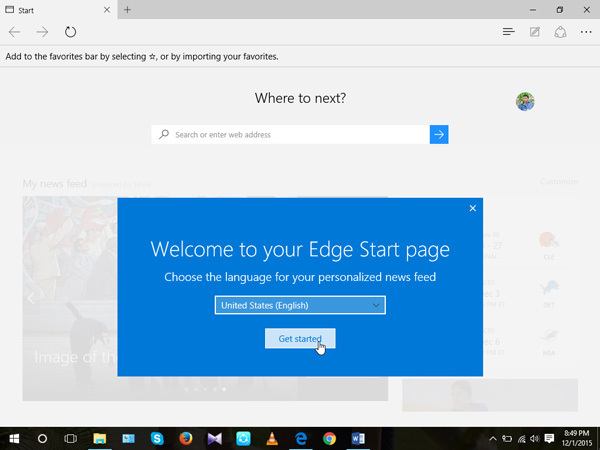 Windows 10 came with new web browser named as Microsoft Edge. It is fast, light and very smooth. It has different types of features such as you can make web notes for the site, Cortana integration and also support the PDS extension files. Remember Windows 10 did not exclude the Internet Explorer yet. You will love the new Windows browser, it much faster than the old internet explorer and light weight too. One of my favorite Windows 10 features is, you can add multiple desktops. If you are working and too many windows or folders open on the desktop and you want the desktop clean and clear to remove the irritation. You can do it by multiple desktops feature, and you don’t need to close the folder just add a new desktop. Press WinKey+Tab and click on desktop 2. You can also add the new desktop by the Task View icon shown in the taskbar. Almost every operating system like Android, iOS, and Ubuntu, etc. has a notification area or Notification Bar. 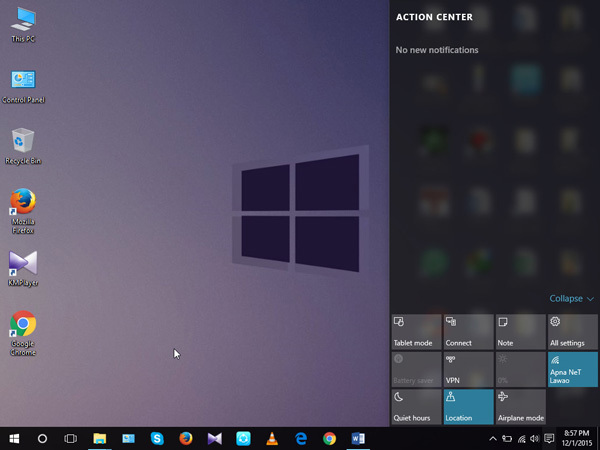 So, finally in Windows 10, Microsoft also introduced the Action Centre. All the notification of the different apps shown on the top and various setting buttons like Tablet mode, Battery saver, Airplane mode, Quiet hours, etc. shown at the bottom of the bar so you can access them quickly. All the previous versions of Windows have a control panel. But now Windows 10 has a new control panel and a new setting design. The new setting interface is quite attractive and somewhat similar to a control panel. By using this setting panel you can set default apps, easily control the devices like printer, Bluetooth, etc., manage your accounts, set privacy and many more. In fact, everything that we can do with control panel also can do via this new setting windows. But, if compared to old control panel new one looks more decent and attractive as I mentioned before. Windows 10 also has a tablet mode. In a tablet mode, the start menu changes to Windows 8 start menu. After launching the tablet mode, your laptop display looks like you are operating a tablet. You can launch the tablet mode from the action center. In other words, it has the ability to convert in different layouts and device modes according to the situations. For example, when you connect your Windows 10 phone with an external display screen, it acts as a mini desktop. Isn’t it a cool Windows 10 feature? Microsoft somewhat changes the file explorer. Now the file explorer has Quick Access list of locations. Instead of recent item showed in the left bar like in older version of windows, now it is shown under Frequent folders. If you look over the ribbon, there are four tabs (File, Home, Share and View). By using Share tab, you can share the item through different apps or through E-mail and many more. You can open File Explorer by pressing “WinKey + E”. 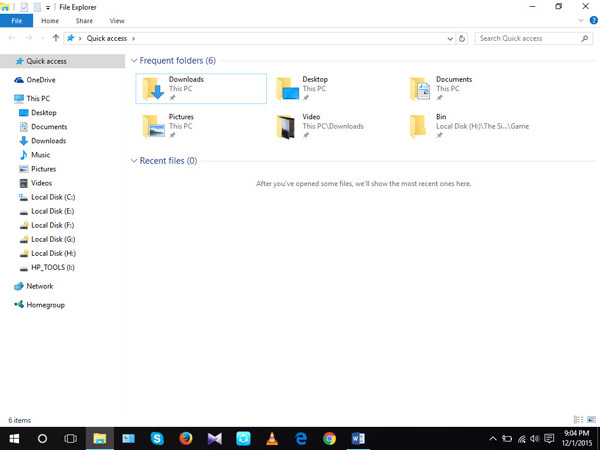 They also add the File Explorer button in the start menu for quick access. Windows 10 comes with a new version of MS graphics API. Due to this new feature, Microsoft has done a major graphics improvement in Windows 10. The new version is also compatible with the older and existing graphic cards. So all the software’s demanding DirectX 12 works speedily and smoothly. If you want split screen of two windows you had to drag the window to the left corner in old OS. But it’s not applicable anymore because now you can use any of the corners to get the snap view. In older version of windows, you drag the windows one by one to get the split screen or snap view but in Windows 10 when the first window drag to any of the corner after that it will show all the open windows thumbnails. Now just click on the window, you want in snap view. Windows 10 came with Xbox app. It means you can stream your games from the Xbox. 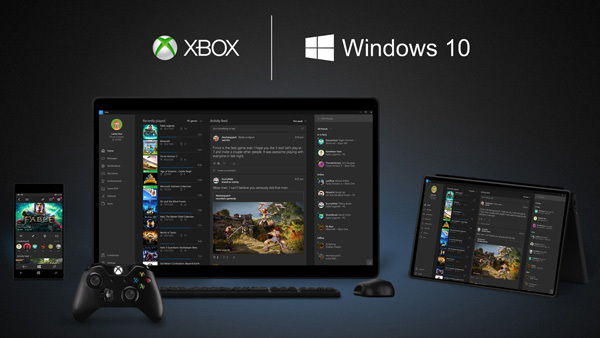 Now you are also able to create a multiplayer game between Xbox One and PC (Windows). Finally, there are the bit of changes in command prompt. Instead of using the commands to the copy and paste that is really more time consuming, now you use the standard keyboard shortcuts to copy and paste in command prompt. So, these are the main new Windows 10 features I found very useful and helpful. I highly recommend you must try new OS. Well, I have shared all the main features that I know about new Microsoft OS and I personally found them very useful and handy. I just loved it. I would like to suggest, you should try at least once Windows 10. Just upgrade your older version to the new one and take maximum benefits from the latest Windows 10 features. I hope you would like this article and learned new things about the Microsoft’s new OS. Do share your thoughts about Windows 10 new features and which feature you think is the most helpful in the comments sections.